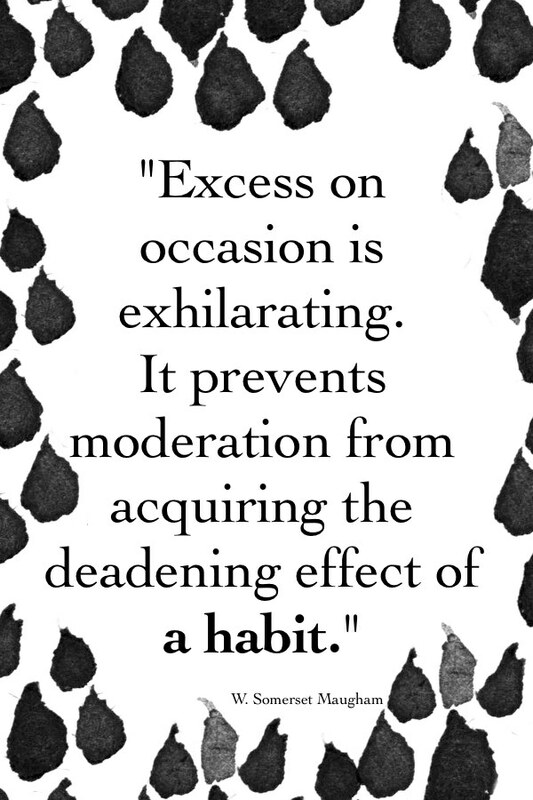 It’s Sunday night and I’ve got a mountain of laundry waiting to be folded, a stiff cocktail by my side, and an episode of Mad Men on my DVR to dive into so I’ll keep this brief. 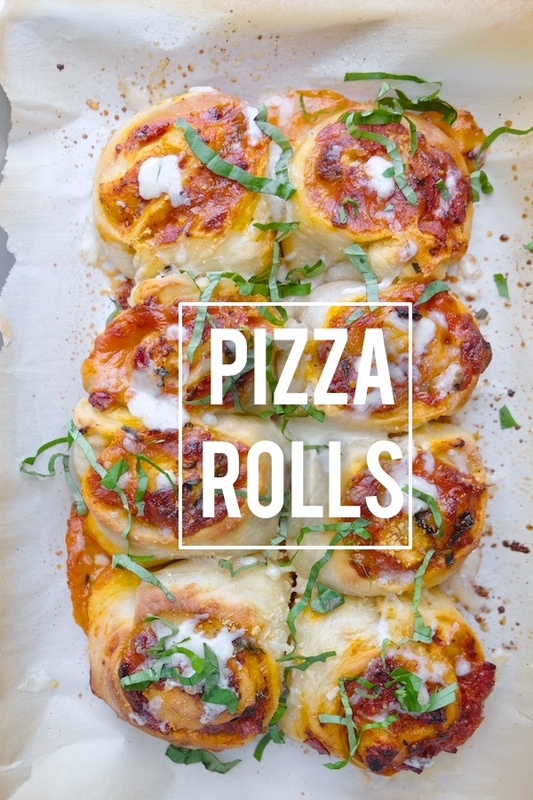 PIZZA ROLLS ARE LIKE CINNAMON ROLLS BUT WITH PIZZA TOPPINGS! The sauce! The cheese! The pepperoni and the basil! It’s all too good. 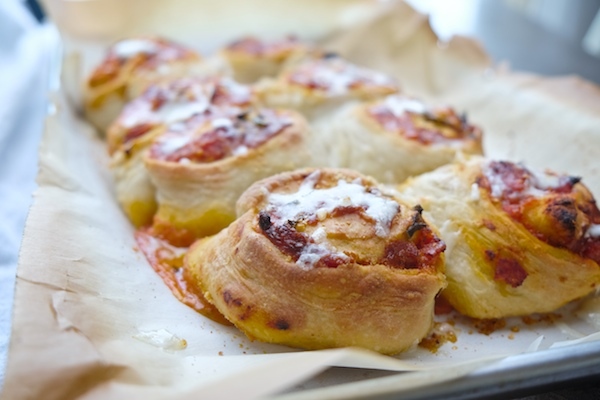 The cheese melts and pepperoni meld together inside of the rolls while the inside marinara seeps out of the bottom…mixing with melted cheese to make an incredible crust. Can’t get enough! 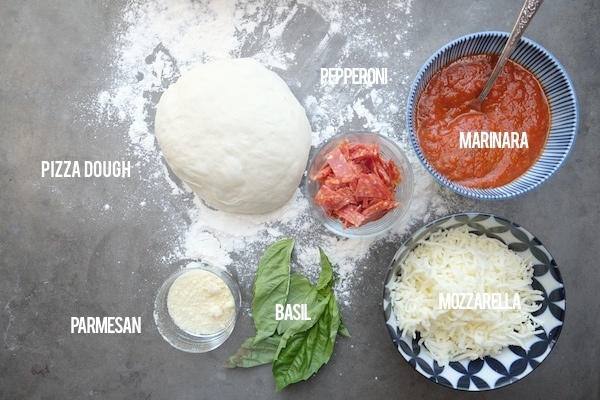 Feel free to add your favorite pizza toppings to the mix. Make sure they’re not too big. 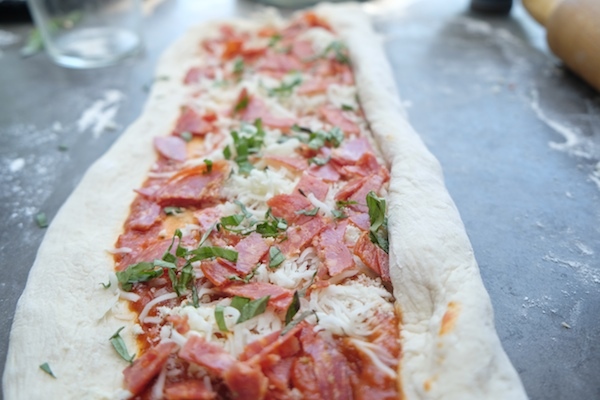 Spread a thin layer of marinara across the dough, leaving an inch border around the edges. Top with cheese and pepperoni. Add a little basil and parmesan too! Now start rolling the dough lengthwise. Baked! Cheese extra added on top. More baking. Get over here already! Bring the red pepper flakes! 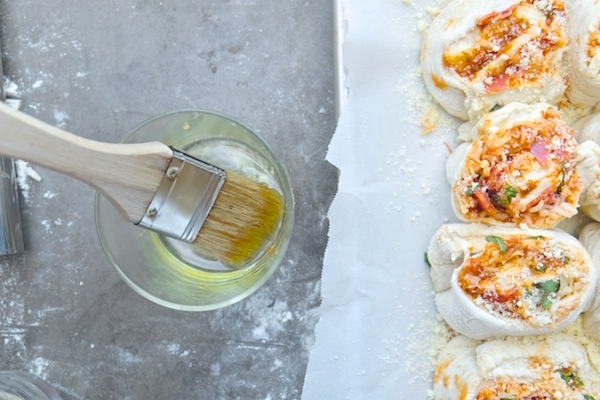 Line a baking sheet with parchment paper and drizzle the surface with 1 tablespoon of olive oil. 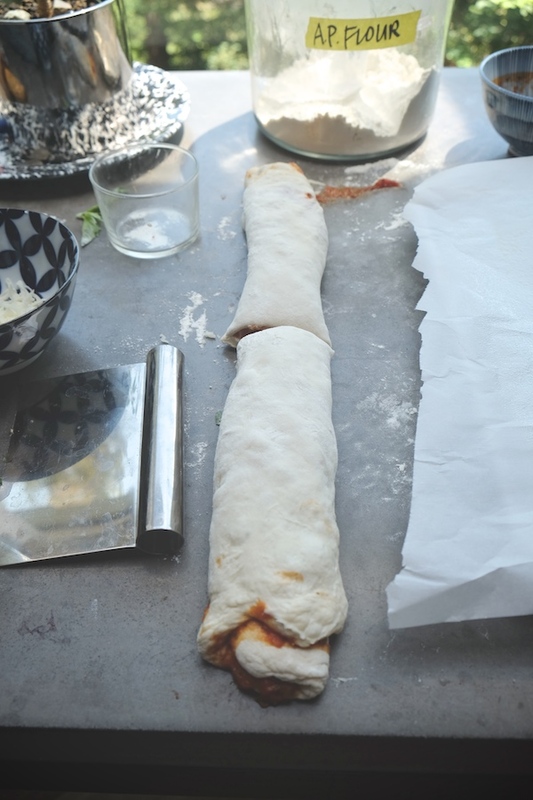 On a floured surface, roll out pizza dough into a rectangular shape, roughly 9 x 16 inches and position so the short sides are parallel to you. 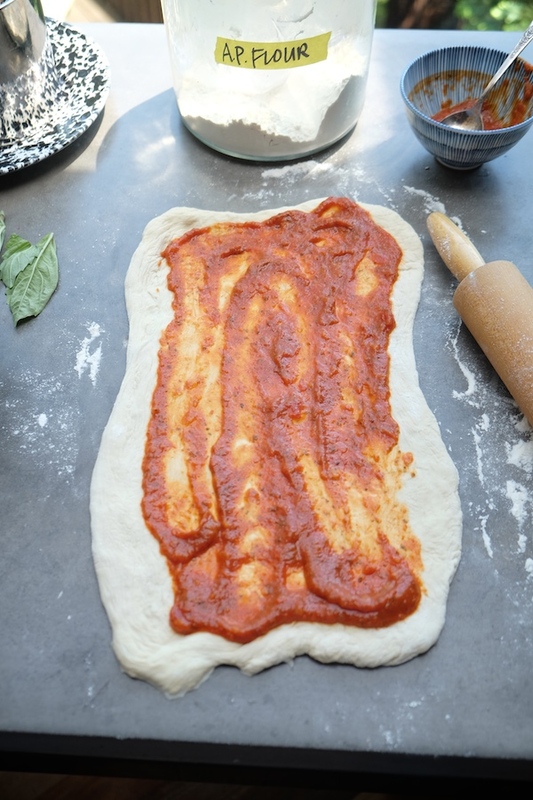 Spread the marinara sauce evenly on the rolled out dough, leaving about a 1″ border around the dough. Place 1 cup shredded mozzarella cheese, followed by pepperoni and basil and 1/8 cup Parmesan cheese. 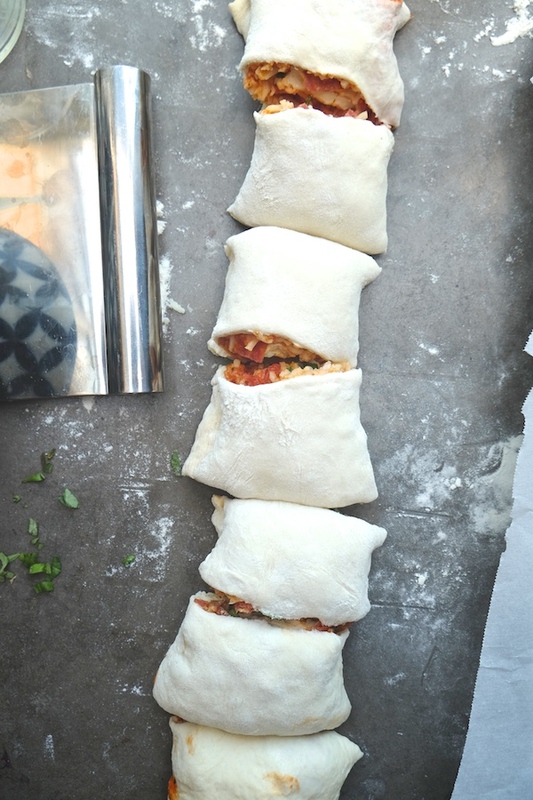 Using your hands, lift up the bottom edge of the dough and roll it forward into a tight cylinder. Place dough cylinder, seam side down, on a cutting board and, using a thin, sharp knife, cut cylinder crosswise into 8 equal-size slices. Nestle the slices, cut sides up on a parchment lined baking sheet. 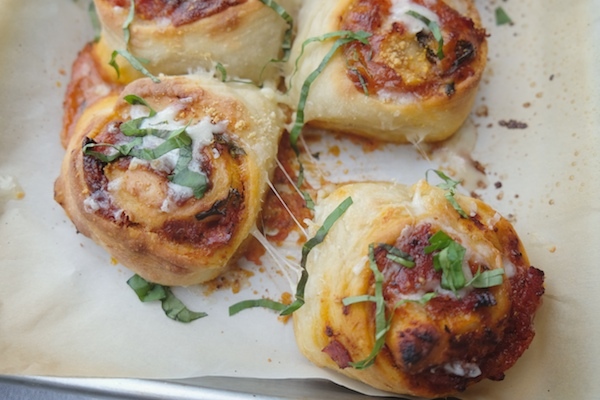 Brush 1 tablespoon olive oil onto the edges of the dough and bake until golden brown about 15-20 minutes. 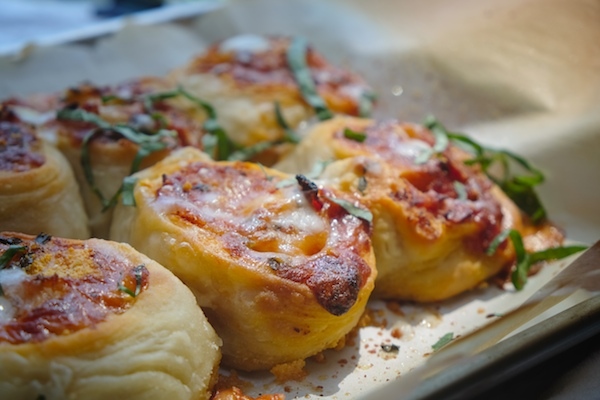 In the last two minutes of baking, pull rolls out of the oven and top with 1/8 cup shredded mozzarella and a light sprinkle of the remaining Parmesan cheese. 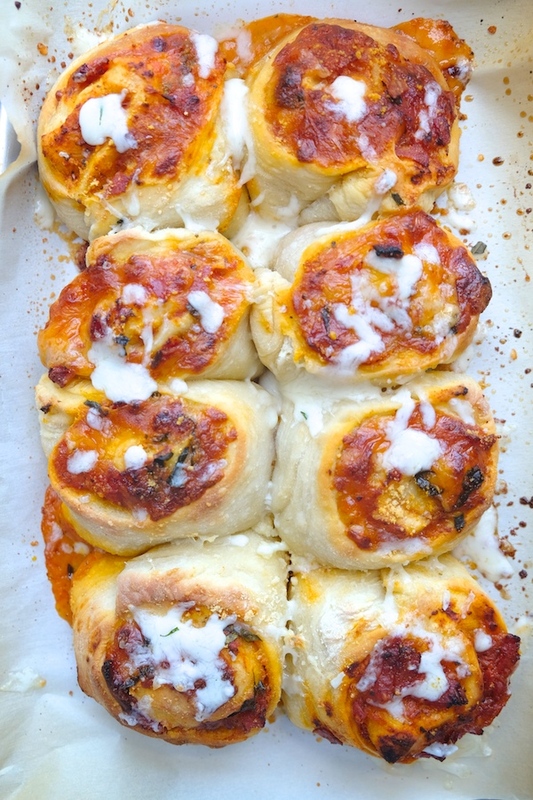 Place rolls back into oven and bake until cheese melts. 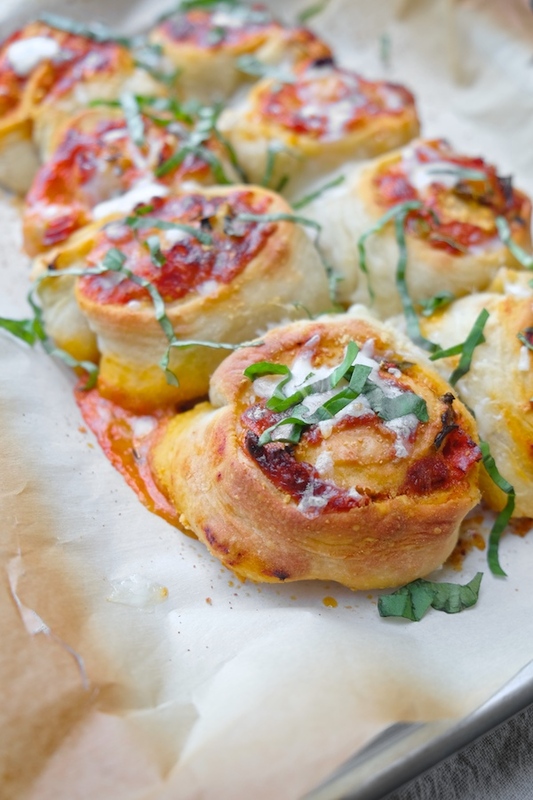 Remove rolls from the oven, let rest for 5 minutes and sprinkle with chopped basil for serving. I want to eat this for dinner tonight!! Looks so good. You can never go wrong turning pizza into anything!! Our Sunday nights are eerily similar (though sub The West Wing for Mad Men, because I’m actually 80 years old.) Next time, I want the cocktail AND the pizza rolls to go along with it! 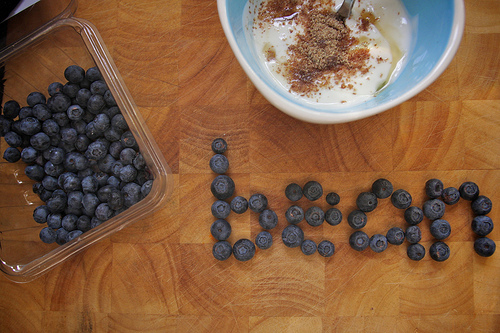 I just made something like this for my kids for lunches. Baked them in greased muffin tins to help keep their shape. I froze them on a cookie sheet, then popped them in a Ziplock bag. Easy lunch that the kids (and grownups!) love! 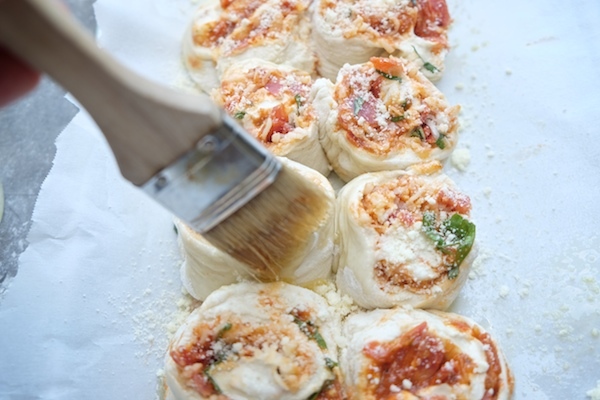 I like the idea of topping them with a big more mozzarella, because always more cheese! Fabulous idea. I can never quite get the pizza dough cooked when we make normal pizza, so perhaps changing the form like this is what I need to do. Did they reheat well? I love the sound of these. Tracy, how do you think these would freeze? 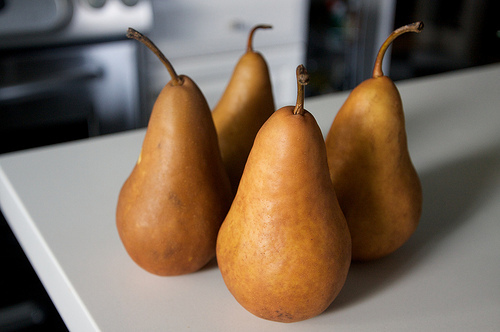 I’m thinking these would be a great thing to have in the freezer and just defrost when you’re in need of one, i.e. 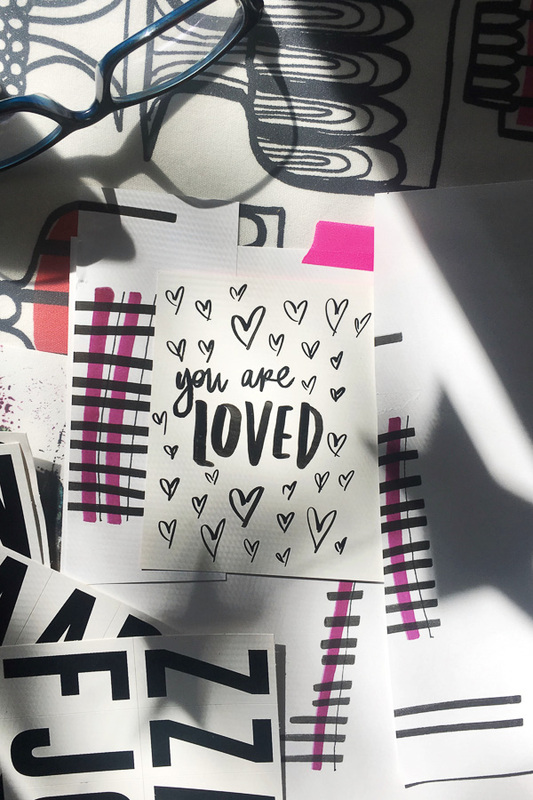 lunches, midnight snacks, when you’re feeling all the feelings, etc. They should work out fine. 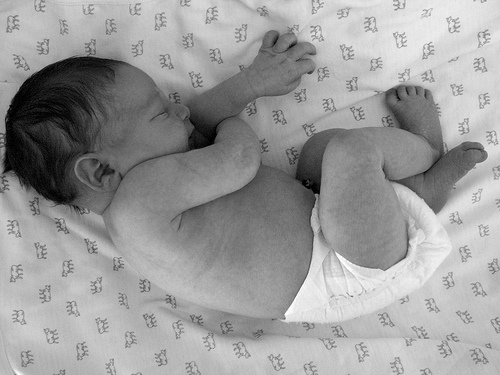 Just wrap them up tightly and add a little extra baking time. I baked them first. Once they were cooled, I froze them on a cookie sheet them popped them in a Ziplock bag. You can defrost one or two (or three if you’re my son) at a time as you want them. 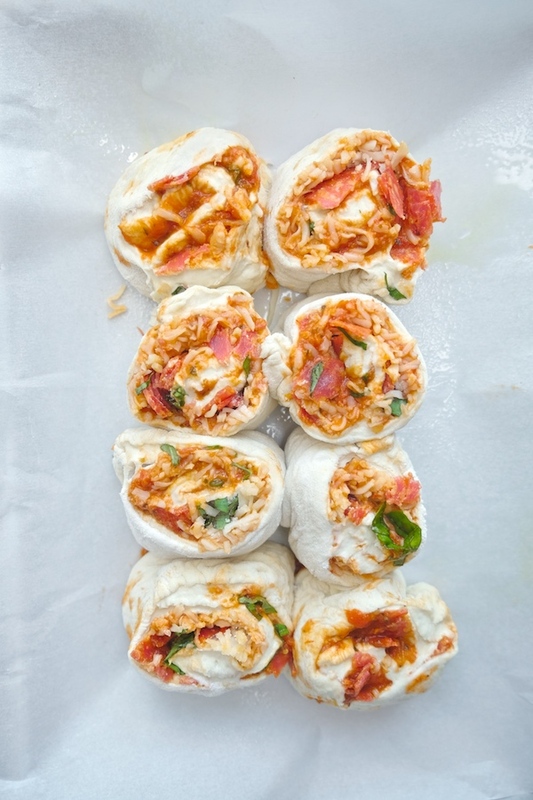 Oooh it’s like pizza sushi rolls! These look great! I will be trying these out as they will be a fun addition to kids lunch boxes. What type of counter top do you have? Is it polished concrete? 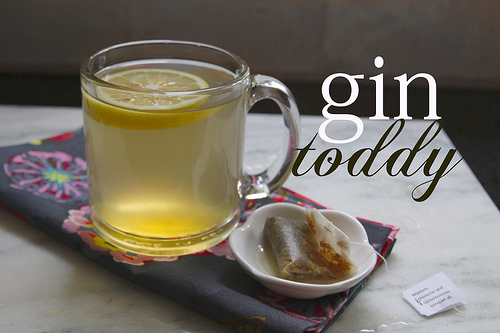 I am currently fantasizing about redoing my kitchen….. I just made these for lunch. They are SO GOOD and amazingly easy. My two-year-old thanks you as well 🙂 Thank you so much for this great recipe! These look incredible. 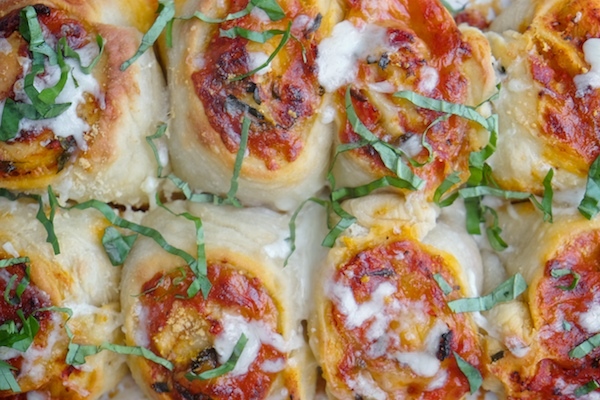 I seriously wish I had some defrosted pizza dough so I could make them for dinner tonight. Pinned for later, because I will 100% be making these soon. 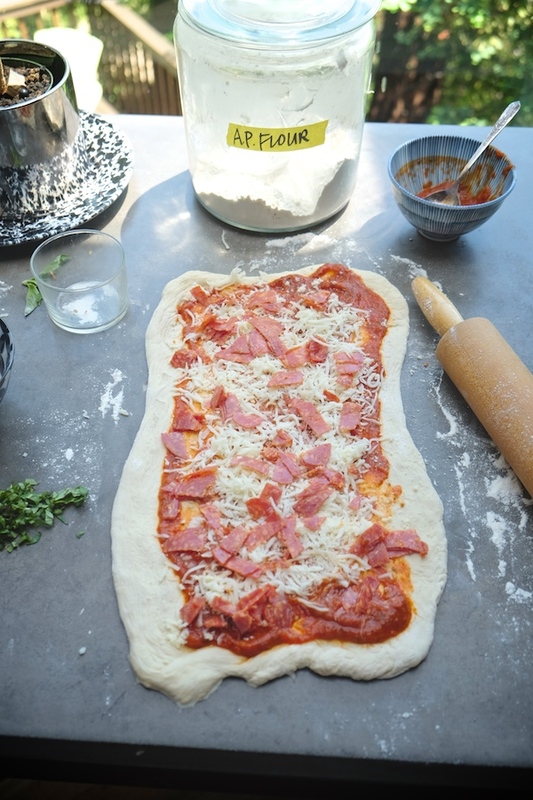 What recipe do you use for your pizza dough? YAAAAAAY!!! That makes me so freaking happy! Thank you! yum! i’ll definitely be trying this! 🙂 thanks! I gonna make this too!! This looks so delicious! Cocktails, Mad Men, and these pizza rolls? Man, I wanna be part of your Sunday night! These look crazy good and fun to make. Doing this with my kiddos. Pizza night just got a lot more fun! 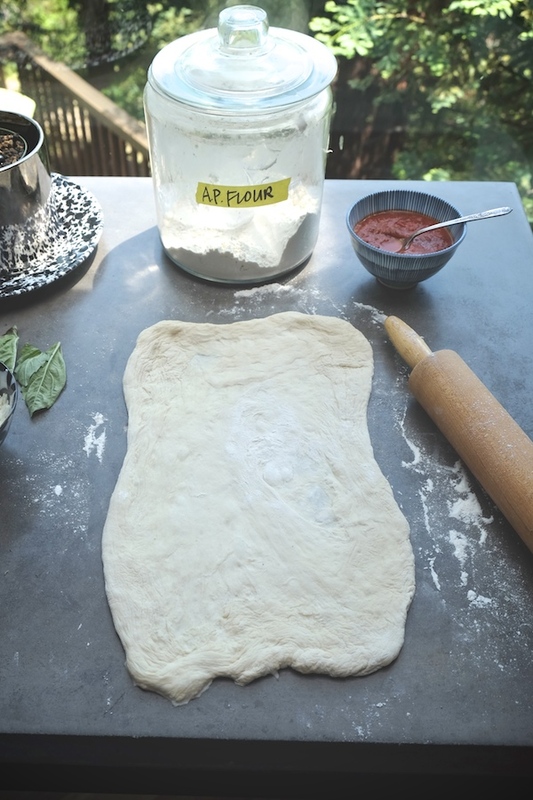 This is a perfect resolution to store bought pizza dough that just doesn’t want to stretch into a circle (or any other circular shape). 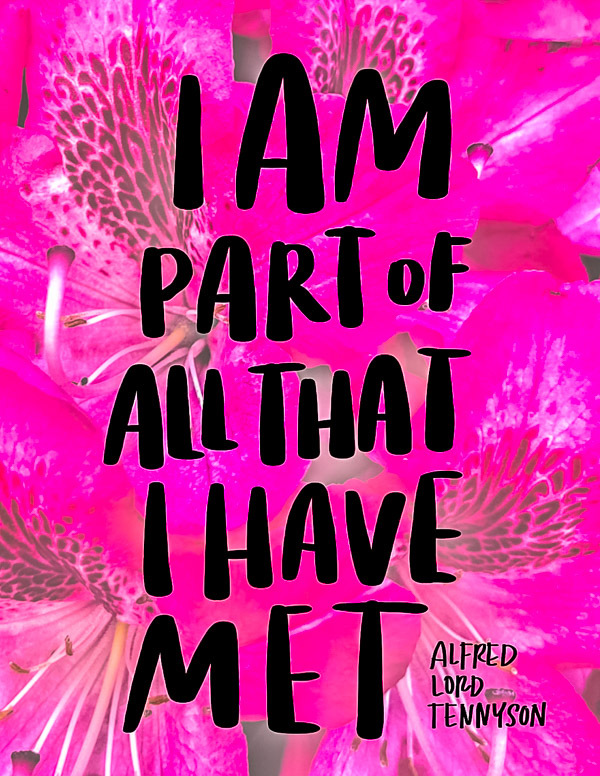 Totally! Sometimes I find the store bought dough really hard to work with. This solves that problem! Pizza=Love. These look so freaking amazing. OMG. These are my dream. I would totally eat them for breakfast too! Who needs cinnamon rolls when you can have these?! Making tonight! 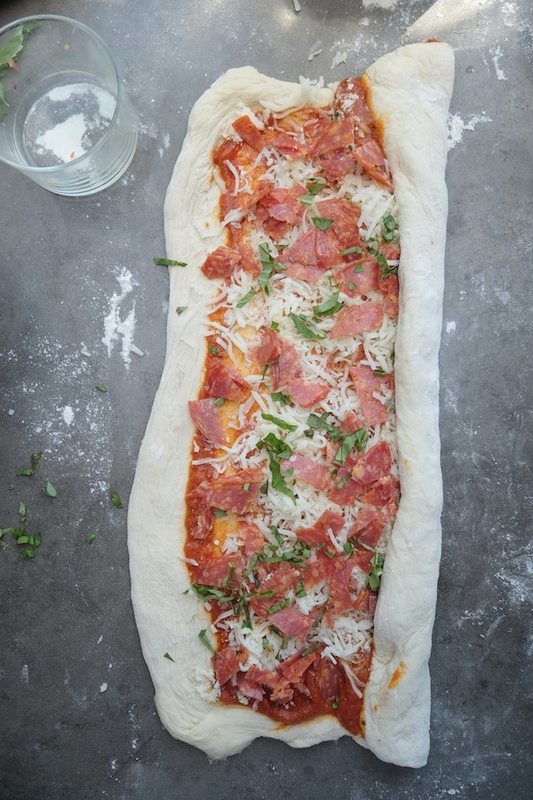 Would you recommend using the whole no knead pizza dough recipe for this? (enough for two pizzas) or half of the dough? I would use half the dough! Yes, half the dough was the perfect amount. They were delicious! I think we know what I’m having for dinner tomorrow!! Just made these rolls, they are so dang good! I had to put them out of sight because I started snacking on them before my husband came home for dinner.. I used the NY Times Quick Pizza Dough recipe, worked like a charm (http://cooking.nytimes.com/recipes/1017334-quick-pizza-dough). Thanks for another great recipe! These are AMAZING! Just made them for dinner and it’s taking all my willpower not to devour them all. LOVE!